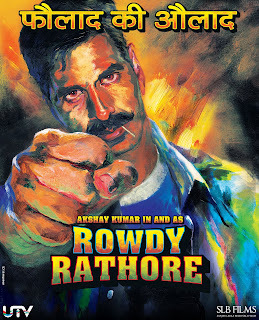 Rowdy Rathore has set the box office on fire with collections of around 48 crore nett in its first weekend. It is the biggest opening weekend of the year so far. Rowdy Rathore has rocked the nation on Sunday at single screens and multiplexes and may go on to be the highest grossing film of 2012. The first weekend business of Rowdy Rathore is around 48 crore nett range It has emerged as the fourth biggest opening of all time, behind Ra.One (2011) - 52.93 crore, Bodyguard (2011) - 52.62 crore and Dabangg (2010) - 48.82 crore. Rowdy Rathore was rock solid on Monday as it collected around 9 crore nett. The collections are less than Dabangg and Three Idiots which went over 10 crore nett on Monday but the Monday collections of Rowdy Rathore is the biggest of 2012 comfortably beating the figures of Agneepath and Housefull 2. The single screen numbers for Rowdy Rathore are on par with Dabangg with the difference in the two films being at multiplexes where Dabangg had better collections.